Just as subtraction is the inverse function of addition, and division is the inverse function of multiplication (because with inverse functions, one ündoes" the other), there is also an inverse function for a power and we call it the logarithm. 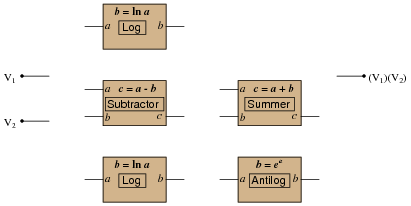 Electronic calculators with logarithm capability have at least two different types of logarithms: common logarithm and natural logarithm, symbolized as "log" and "ln", respectively. Explain what the difference is between these two types of logarithms. The common logarithm function assumes a "base" value of ten, whereas the natural logarithm assumes a base value of e (Euler's constant). Note that some calculators will show just enough digits of e to give the false impression that they repeat (ten digits: e = 2.718281828). If anyone suggests that e is a (rational) repeating decimal number, correct this misunderstanding by telling them it is irrational just like p.
Rewrite the four equations together in such a way that the same numbers are related to each other, but without writing "log". In other words, represent the same mathematical relationships using some mathematical function other than the common logarithm function. 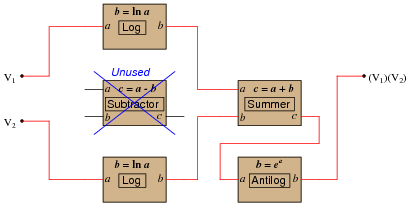 An illustration like this helps students comprehend what the "log" function actually does. The product of two base numbers with different exponents is equal to that base number raised to the power of the exponents' sum. The sum of two logarithms is equal to the logarithm of those two numbers' product. Since the others are easy enough for you to check (with your non-broken calculator! ), I'll leave their solutions in your capable hands. The quick answer to this very good question is, "when it is more difficult to directly multiply two numbers." The trouble is, most people have a difficult time imagining when it would ever be easier to take two logarithms, add them together, and raise ten to that power than it would be to simply multiply the original two numbers together. Discuss what mathematical operations are being done with the constants in these equations, by using logarithms. What patterns do your students notice? Also, discuss the terms "log" and äntilog," and relate them to opamp circuits they've seen. Ask your students whether or not they think it matters what "base" of logarithm is used in these equations. Can they think of any other arithmetic operations to try using logarithms in this manner?